Cameron Estates is Ames’ newest luxury living development. Click this map to link to an interactive map with full details on available lots! Located just northwest of Ames on Cameron School Road, the development offers large lots in a serene, country-like setting. Additionally, the development offers convenient access to Ames – just five minutes to Iowa State University and less than 10 minutes to downtown – Gilbert, Boone and all major highways. To learn more about purchasing your lot, please contact Friedrich Iowa Realty at 515.232.6175 or toll free at 800.681.7333. Friedrich Land Development has had a major impact on Ames’ growth. In 1939 Colonial Village, one of central Iowa’s best examples of authentic colonial architecture was built, and the homes are still very popular today. 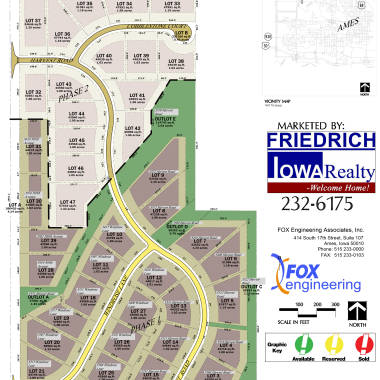 Since then Friedrich’s has completed over 50 subdivisions representing hundreds of homes and apartment complexes. Our goal is to make the best use of the land and to meet the needs of the people we serve. Providing good buildings sites is an essential part of being a full service real estate company. Ask any agent about lots in our established Kinyon Crossing, Northridge Heights, Ringgenberg Park, Somerset, and Suncrest subdivisions. Want to learn more about how Friedrich Land Development can help you build your dreams? Just fill out the form below and one of our agents will reach out to you!